So I scoffed these cards from my uncle because I wanted to blog about them, although I know nothing about them. They were in a small plastic bag in the shoebox and I thought they would make for great conversation, and perhaps we can identify these because like I said I am too lazy to do the leg work on this. Not to mention have a ton to study, which clearly you can see isn't getting done. I just had a glass of milk and I am ready for bed despite not knowing half of what I need to know. I have turned into an old person, a glass of milk and bed. Sad. Here are the cards, I scanned the back of one as just a sample of what they look like. There was one other card that is in terrible shape, it was bent down the middle and looks like it may have been stored that was for a long time, or used in flipping or a bicycle years ago. 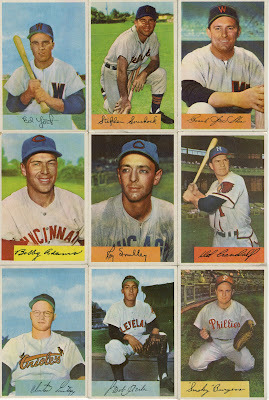 I think these cards are awesome because they are actual vintage as opposed to "new" vintage designs we see now. 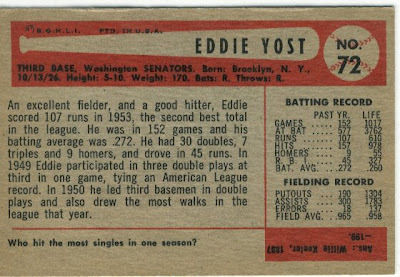 I am very partial to retro designs and love them, but nothing comes close to holding onto cards like this. I won't lie and say I know the value but value is only what someone is willing to pay or accept for something as far as I'm concerned. If anything here strikes anyone's interest let me know and I will relay it to my uncle and see what he was going to do with these. Stay tuned tomorrow when I am not studying and blogging about the contents of 2 OPC blasters. I have become slightly obsessed with these cards since finding out they will be scarce later. Those are some pretty slick cards. I would have had to do some research to figure out what the were too. Thanks from here too, Captain! As far as being interested in any of them goes, I am interested in the Roy Smalley if there are no other plans for it, cuz I hearts me some Cubbies and ebay tells me even my poor self should easily be able to afford it. Wow, those are really cool! 1954 was the first year the Orioles existed in modern form, and I've never seen that uniform or logo before. I would be interested in that one card, yes. 1954 Bowman cards go for $1-3 as low-grade commons. Those look nicer, probably closer to $10 depending on the corners and edges. That's a nice discovery for you and your uncle, regardless of $ value! 1954's notable for the Ted Williams card as CC said, which Bowman had to pull and replace with Jimmy Piersall as #66. They did have the exclusive on Mantle, who had no 1954 Topps card. wow - they look fantastic. Those are splendid cards. If you ever want to part with them, let me know. I love the vintage stuff. Would you buy umpire cards? Are we all just a bunch of suckers?